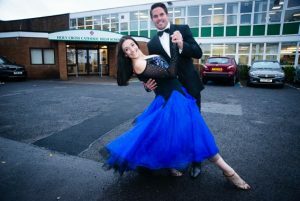 Good luck to two Holy Cross teachers who will be putting their best feet forward and competing in Strictly Come Dancing for Bury Hospice on Saturday. Head of Technology Miss Moore alongside PE teacher Mr Stokes will putting on their sequins and strutting their stuff in a bid to win the Glitterball. It was Miss Moore’s idea and she is competitive – especially after winning Holy Cross’s charity version of Strictly last year. “I am from Bury and Bury Hospice is my local hospice,” said Miss Moore. “We have been having lessons for 12 weeks every Monday at the Touch Of Class studio and I am quite nervous now it’s nearly Saturday – especially as we want to win. Mr Stokes competed for Team GB at the London Olympics in the steeplechase but admits he feels more worried about Saturday’s finale at the Longfield Suite in Bury. “I am really nervous. It is nerve-racking, it’s worse than competing in the Olympics as it’s outside my comfort zone. Miss Moore and Mr Stokes will do a group dance, a foxtrot, a quickstep and then their speciality the Argentine Tango. So far around £20,000 has been raised by all contestants for Bury Hospice.